We want you to have absolute control over how your case looks and functions. The FreeForm™ Modular System of the MC-Series lets you adjust the exterior structure and aesthetic via a range of replacement panels and doors. Each choice changes the look and feel of the case, but also the flexibility of the interior layout. 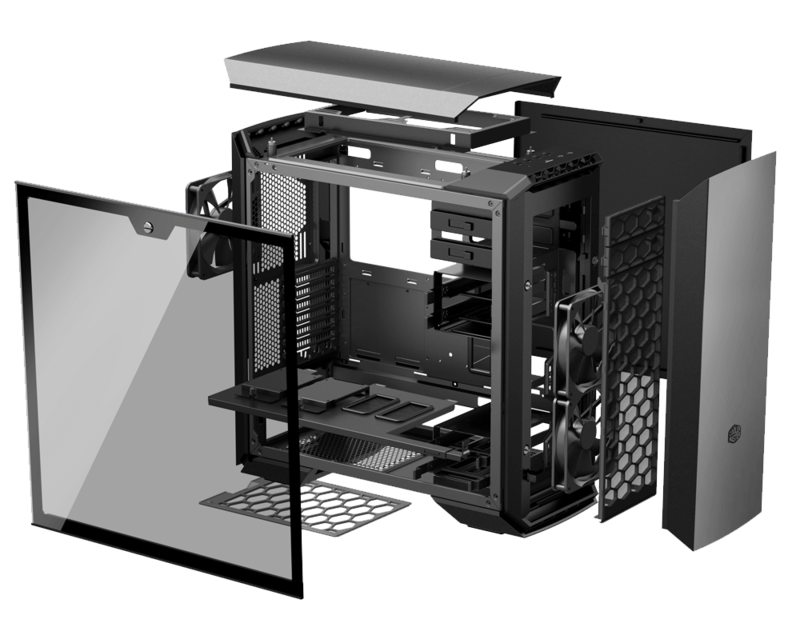 The option to relocate the M.port and remove the partition plate gives you the freedom to adjust the inside of the case. With the partition plate installed, you isolate the power supply and cables for a clean build. Thin vents on four corners of the case provide ventilation. Pop the top and front panels up slightly for even more cooling options. With a convenient magnetic system, feel free to increase the airflow or simply remove your panels for easy access to your fans. Cooler Master was the first to make a CPU cut out hole and we are the first to cover it again. A PSU shroud and additional cable covers take cable management to the next level. Assemble clean builds like a pro! Get a cleaner look by hiding your messy cables into the removable rear panel. But this isn't just about aesthetics. Each decision opens new possibilities. Leveraging our unique clip-and-click panel, FreeForm lets users vertically adjust or entirely remove your optical disk drive (ODD) and HDD via sliding locks so intuitive you'll play with your configurations just for fun. Well, some people will. Just click-in the cages, and adjust the height to suit your needs. Position them at the top to allow room for up to three extra-long graphics cards, or retain only the bottom positioned cages to add a front-mounted radiator for even more cooling options. The first Cooler Master case to incorporate two easy to install slip-and-clip solid-state drive pockets (2.5") with four easy mounting positions. Showcase them on the partition panel or hide them behind the motherboard tray for a cleaner look. FreeForm extends beyond the case to include all the support you need in terms of selecting and purchasing components through a range of accessories to truly help you Make It Yours.